When companies I love (as a customer) and admire/enjoy writing about (as a journalist) do something that seems downright crazy to both sides of my brain, like splitting up a well-known brand and its useful and well-loved website, I tend to wonder if I’m missing something. Netflix’s announcement that it would split into a streaming-only business (called Netflix) and a discs-by-mail business (called Qwikster) caught me by surprise. It’s easy to miss a lot of things when you’re surprised, particularly when the surprise drops after midnight on the east coast, and you stay up all night writing and talking about it. When this happens, it’s best to look for smart people with different opinions from yours, who’ve probably also had more sleep than you have. Here, I’ve gathered these opinions to make the best possible case for (and explanation of) Netflix’s decision to divide itself, its web site, and its subscriber base (just on paper — we hope) in half. I’ve also added my (and others’) skepticism. With this new term, Netflix could not afford to pay for digital content for someone who wasn’t watching it. This forced the separation, so that the digital business model would exist on it’s [sic] own free and clear. Could Netflix have simply paid the digital fee for all its customers (those that watched and not)? One has to believe they modeled this scenario, and it looked worse financially than the model they chose. WIRED: Let’s suppose that Netflix couldn’t convince studios to consider only its streaming customers and not its total subscriber base with its pricing and bookkeeping changes alone. Then, paradoxically, fewer total subscribers becomes a bad thing for Wall Street, but a good thing for negotiating content rights. Netflix couldn’t stand that two-sided squeeze; it had to do something radical, to continue to get the best deals at the lowest rates for its customers. TIRED: This is so handy an explanation and so much more customer-friendly than the actual apology Netflix CEO Reed Hastings offered that I can’t believe Hastings wouldn’t use it himself, even if it weren’t actually true. You don’t even have to paint the studios as bad guys. Everyone would infer that anyways. We’re truly sorry that we had to raise prices without getting more content in return. But we want you to know the truth: we’re working as hard as we can to make sure we never have to do that ever again. This split is part of that. We don’t want streaming subscribers to pay more because of the sheer number of our DVD customers, and we don’t want our DVD customers to have to pay more because we’re trying to get the best possible content for streaming. It’s potentially tricky to do, but it’s 1) better than just waving your hands with mysterious references to making things better, and 2) not any trickier than explaining why using a new name and a new web site will be a good thing. It also allows you to re-iterate why Netflix passed on Starz this time around: the company is laser-focused on negotiating the best possible deals for content, without any extra complication or unnecessary price hikes. The company knew this split was coming, and would make things more difficult for streaming and mail customers; adding premium tiers for cable channels, especially before the subscriber base was fully split, was just too much. A corollary to this idea is the argument that Qwikster, by not being tied to these acrimonious streaming negotiations, will be in a better position to negotiate deals for new disc releases. I think they probably lose at least as much in leverage with the studios as they gain in goodwill, but I’d be willing to be proven wrong. WIRED: Let’s call this the “HP Kills the TouchPad” strategy. Dealing in physical things is a pain. The margins are terrible and you’re at the mercy of everything from a lousy economy to scratched disks. Every analyst would tell you that a company focused on a growing, high-margin business is better-positioned than a company trying to prop up a legacy business at the same time. TIRED: The trouble with this argument is that Netflix’s biggest problem right now isn’t its competition, but its customers. This is why I like Frommer’s framing of this argument better than Huster’s, because Frommer actually acknowledges that Netflix’s move is explicitly customer-hostile. The pricing change triggered a customer revolt; the impending loss of Starz content gave customers even more reason to be unhappy. Netflix is trying to address this with a move that makes investors with MBAs mildly happy and customers with pitchforks profoundly unhappy. That could turn a revolt into a full-fledged rebellion. 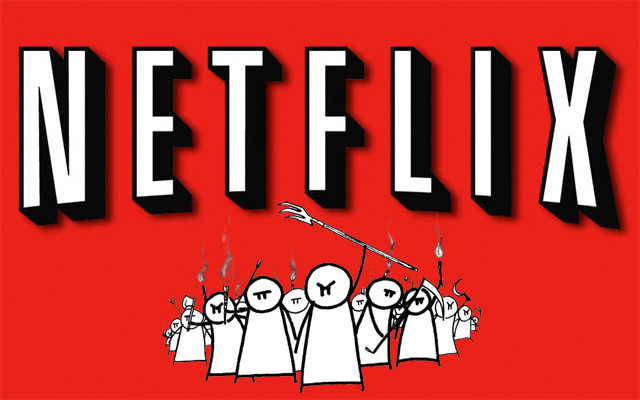 Why is Netflix splitting its world based on business models rather than users’ mental models? They’re being foolish. Where are movie ratings going to go? To the Qwikster website? Will it or won’t it affect the streaming recommendations? ::faceplant:: And why the hell change the brand for the DVD delivery when DVD-only users are the least likely to understand what the changes mean? Wow for brand cluelessness. Why is Netflix splitting its world based on business models rather than users’ mental models? That’s the question I can’t answer either. After the merger, the two companies would compliment each other’s offerings, synergize their brands, make subscription and queue management easier for subscribers, and use the extra resources to negotiate better deals for content. It would be all about bringing Netflix’s simplicity to Qwikster, or vice versa. All of the Wall Street/Silicon Valley logic would be pointing in the opposite direction. Maybe that’s what’s so alarming about Netflix’s market struggles right now: it signals that even for one of the most successful and innovative companies of the past decade, the arrows to the future point in opposite directions.